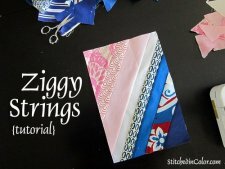 "When I first envisioned my Ziggy Strings quilt, I was actually channeling a herringbone style. I drew thin neutral strips to divide each block on diagonal and imagined them connecting neatly to form a sashing background. I'd use foundation paper to ensure the neutral strips met up easily. Otherwise, the blocks would be filled out with colorful scrappy strips of random sizes, left to meet willy nilly. I wanted to create deeply angled V's using the long, rectangular blocks with the colors connecting from one row to the next. "The best way to emphasize the herringbone style would be to make individual V's, with different colors. And I thought a dark sashing like Kona pepper would do nicely to spice things up. 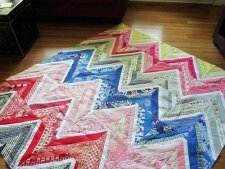 But once I put my ideas on paper, I realized I wanted continuous color zigzaging in rows across the quilt. 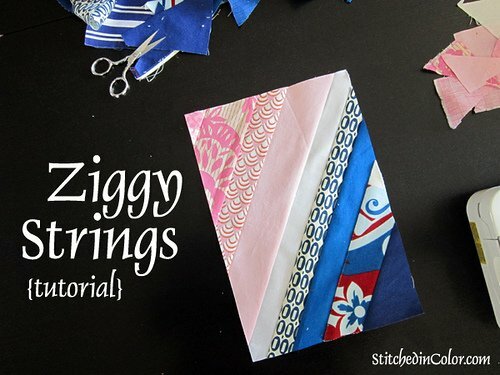 You know, like a classic zigzag quilt, but with strings. I still think the individual herringbone V's would rock though. Maybe you can make that one for me?" 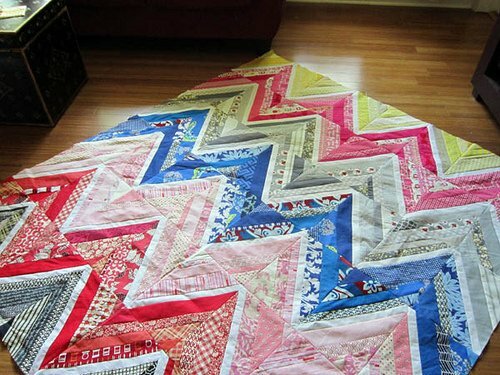 Be sure to take a look at Rachel's finished quilt top!